Paris is not known for skyscrapers. Its largest, the plodding, 690-foot Tour Montparnasse, is also acknowledged as the ugliest building in the metropolis. (Buildings in Paris itself were banned from rising above seven stories two years after Montparnasse was constructed.) And its largest concentration of towers, the La Defense district just west of the city limits, has not produced a critical mass of towers since it was created decades ago. 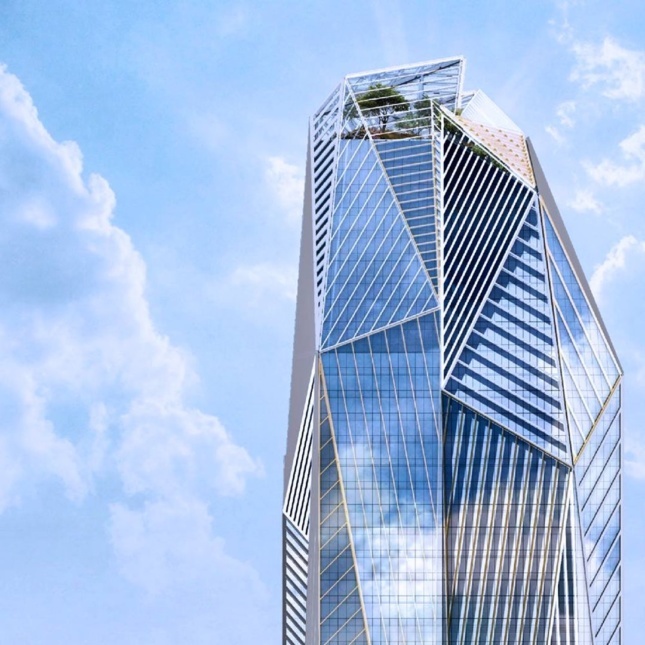 But if plans hold, this is about to change significantly, as French officials and business owners have announced plans to overhaul both Montparnasse and La Defense, while the city’s largest tower since Montparnasse, Herzog & De Meuron’s Tour Triangle, continues to move ahead. 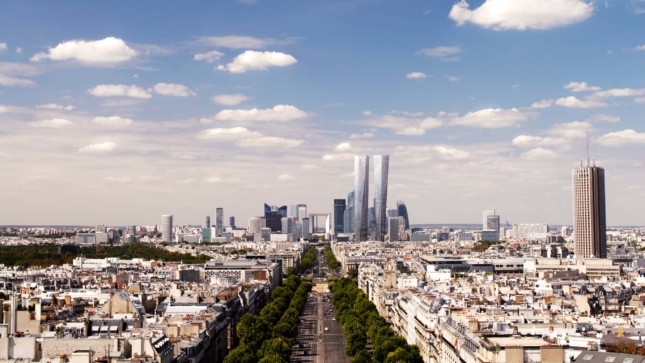 The owners of Tour Montparnasse, Ensemble Immobilier Tour Maine-Montparnasse, last month commissioned French consortium Nouvelle AOM to reclad and renovate the Tour Montparnasse as part of a $350 million modernization. The firm defeated an illustrious shortlist of international competitors that included Studio Gang (the runner up), OMA, MAD and Dominique Perrault Architecture. Nouvelle AOM consists of French architects Franklin Azzi, Fréderic Chartier, Pascale Dalix, Mathurin Hardel and Cyrille Le Bihan. 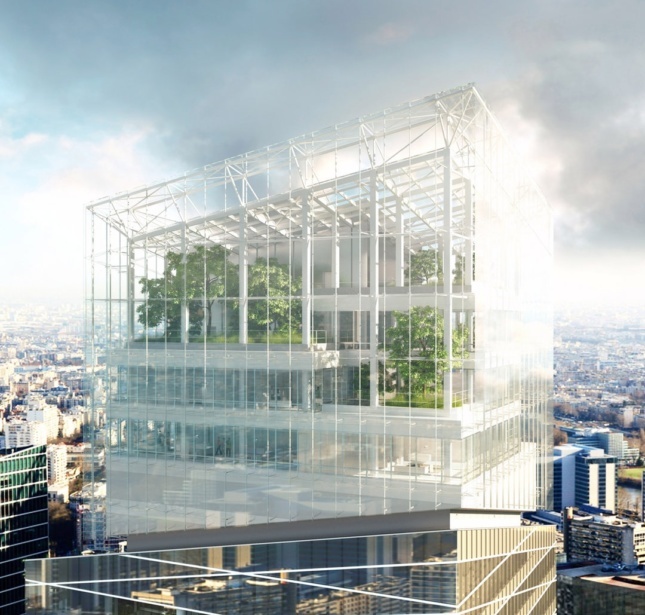 Their plan will not only reskin the muted tower in a crystalline shell of multi-directional glass panels, but it will incorporate gardens into its façade and interior, highlighted by a mammoth sky garden on top. It will also modernize its interior and improve the surrounding plazas and landscapes, knitting the aloof tower back into the city fabric. Meanwhile last winter French President Emmanuel Macron (then still a candidate for President), shared Defacto La Defense’s (the group that manages the area) plans to build seven new skyscrapers in the La Defense district by famed architects incuding Jean Nouvel, Arquitectonica, Foster + Partners, Christian de Portzamparc and others by 2022. The goal—touted by a marketing campaign called “Tired of the Fog, Try the Frogs!”— was to reposition the area as a business alternative to London, where Brexit has cast a confusing pall over international corporations. The towers, if built, would be called Trinity, Alto, M2, Hekla, Sisters, Air 2 and Hermitage Plaza. Marie-Célie Guillaume, chief executive of Defacto La Defense, last winter told FT that they wanted to send a “powerful message to businesses that are uncertain about their future.” It remains to be seen whether all of these projects will indeed move ahead, although, for one, Foster’s web site still lists Hermitage as a go. 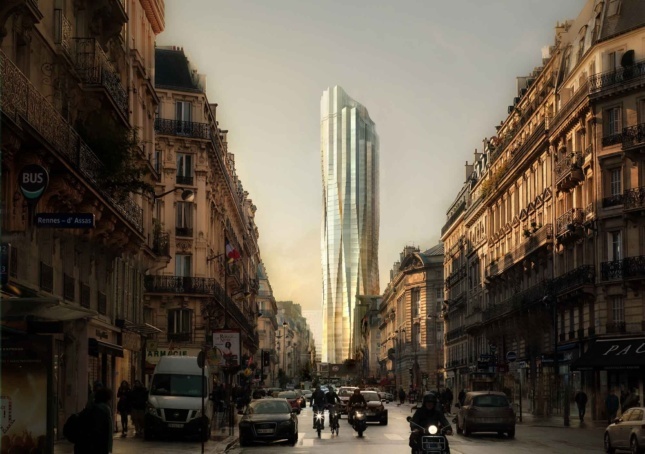 Finally, Herzog & De Meuron’s Tour Triangle, a 591-foot-tall tower that will be the first within the city limits since Montparnasse (that law banning tall buildings in Paris was overturned a few years ago), continues to move ahead since its approval back in 2015. Located on the site of the Parc des Expositions in the 15th Arrondissement, the crystalline building’s pyramidal form is meant, say the architects, to open up a massive internal atrium, reduce shadows on adjacent buildings, and to create an increased setback from the nearby peripheral boulevard. Herzog & De Meuron’s web site lists completion at 2020. Most agree that the Tour Montparnasse is in need of a facelift. As for the remaining towers, Parisians are unsurprisingly split. Many have hailed the influx of offices, residential space and modernity into what is a frustratingly-frozen city. But opponents fear the beloved character that makes Paris Paris is destined to be lost. 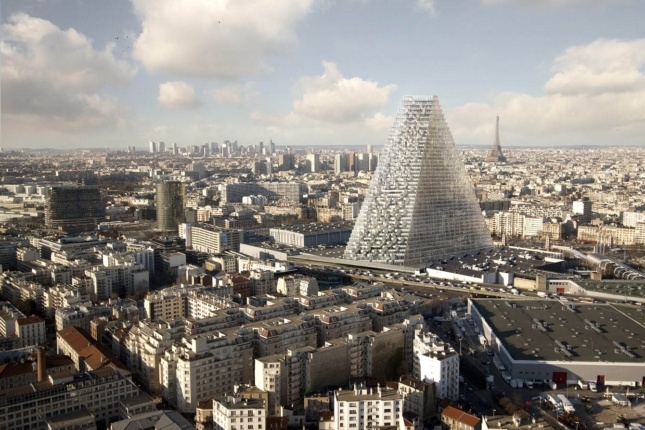 “Unless someone stops them now, international starchitects and their developer and corporate patrons will succeed in vandalizing the horizon of Paris,” exclaimed preservation group SOS Paris after the announcement of the Tour Triangle. On verra. Valode et Pistre’s Tour St. Gobain, another garden-filled skyscraper planned for La Defense.